AIC2009 "A brief classification of colour illusions"
There are a variety of colour illusions. 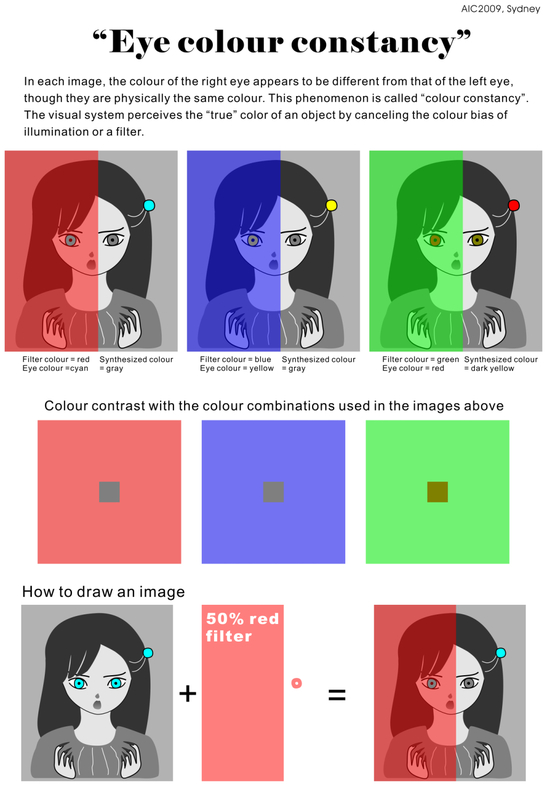 Pale complexion can be improved by color assimilation and contrast. Although sakura are drawn with gray, they appear to be tinted pink. 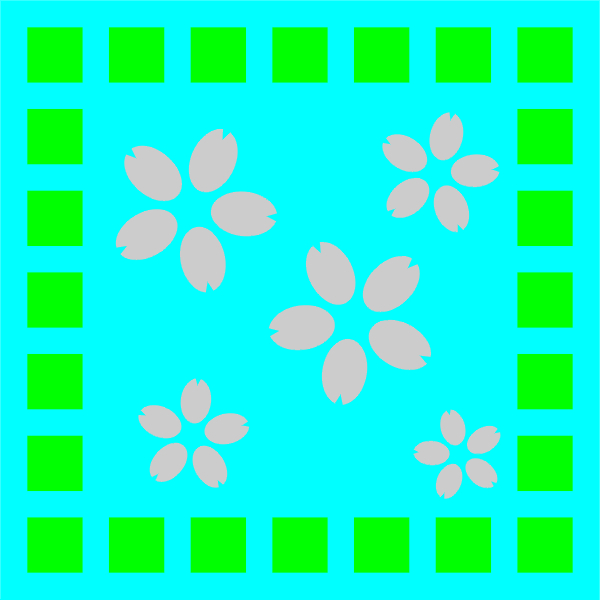 You can confirm that the petals are really gray if you place the cursor on the image. 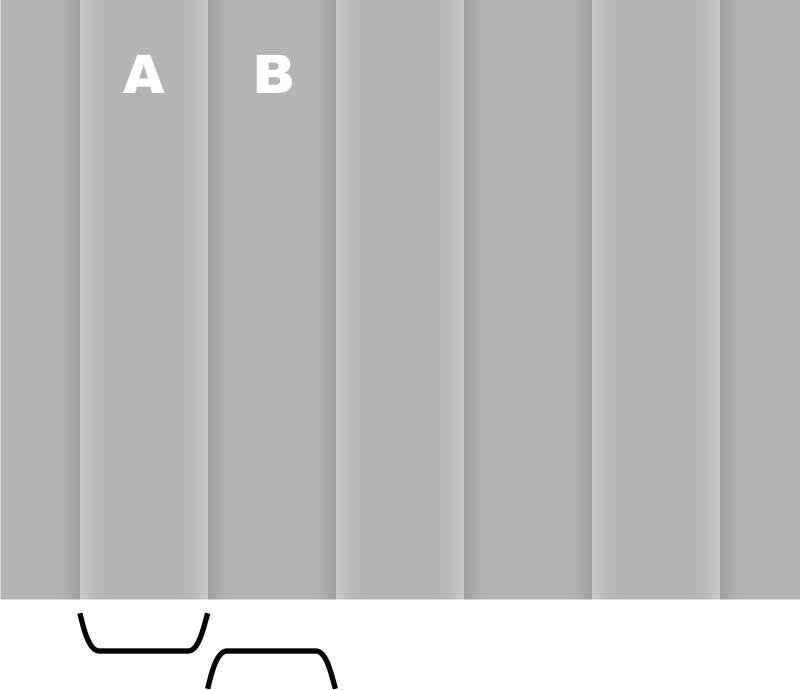 The squares of the upper row appear to be gray, but they are tinted as shown in the lower row that exchanges between the left fives and the right fives. 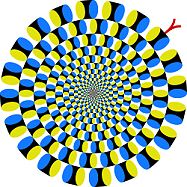 This illusion is based upon a finding of Kasumi Sakai's graduational thesis (2003, Department of Psychology, Ritsumeikan University) entitled "Color representation by Land's retinex theory and Belsey's hypothesis" (in Japanese). 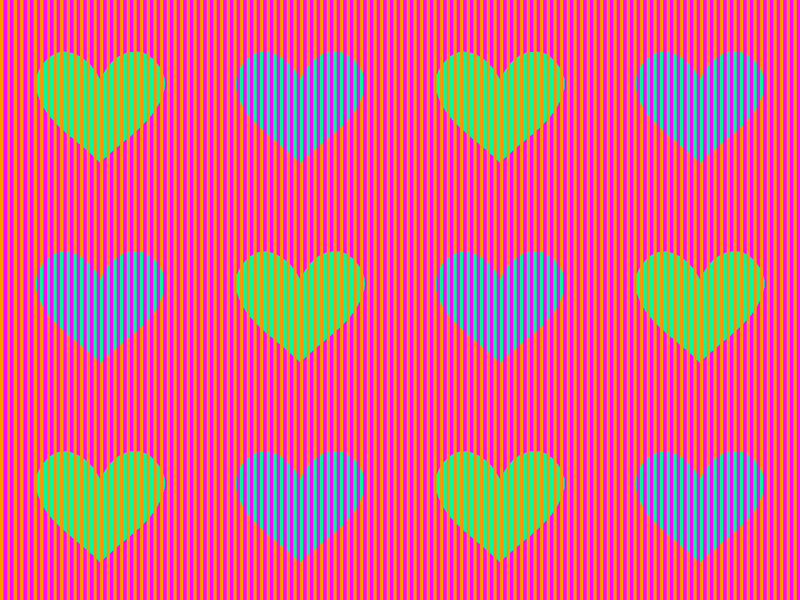 "Striped green and blue hearts"
There appear to be hearts of light green or light blue. Actually, they are identical (R=0, G=255, B=150). The left pigeon appears to be yellowish, but the color is the same white as the right. 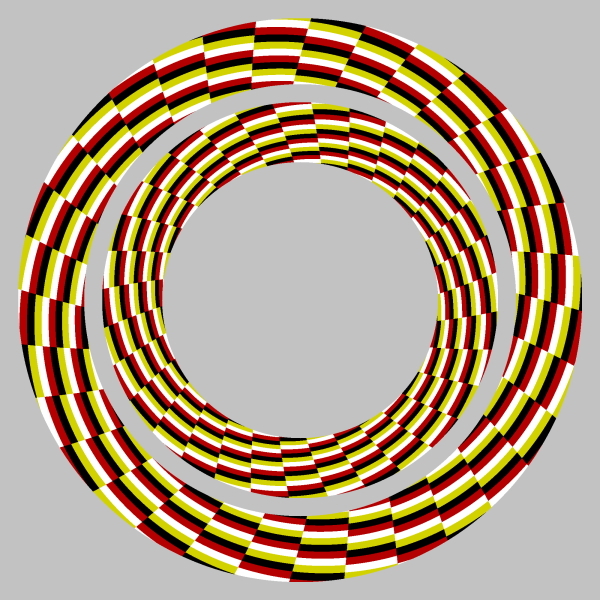 There appear to be two different colors in inner rings, though they are the same as each other. 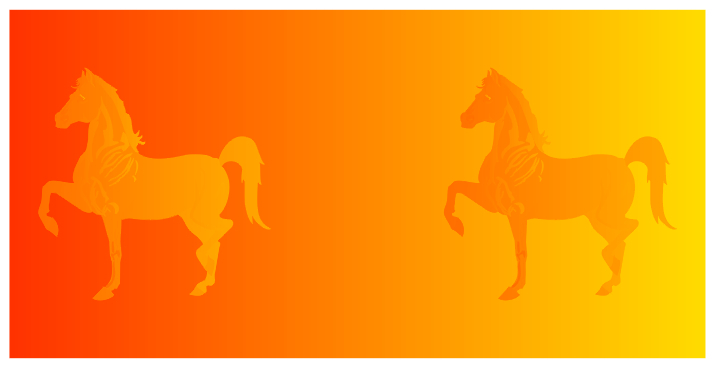 It appears as if there were a yellow horse and a red one, but they are identical in color actually. 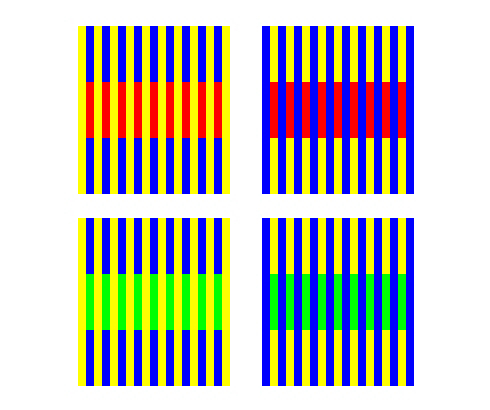 The leftmost square is physically the same colour (gradient) as the neighboring one and the rightmost square is the same colour as the neighboring one, though they do not appear so. 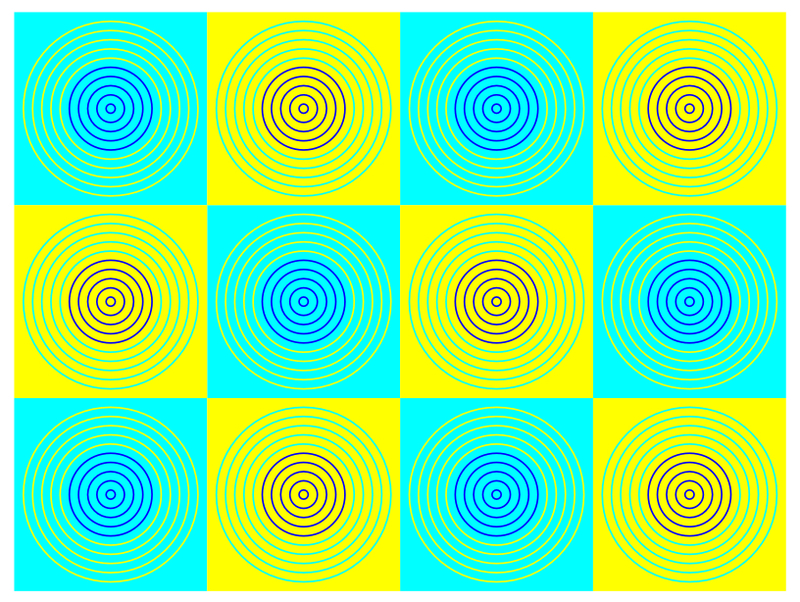 Illusory yellow lines appear to run obliquely over the homogeneously white background. Kitaoka, A. (2001). 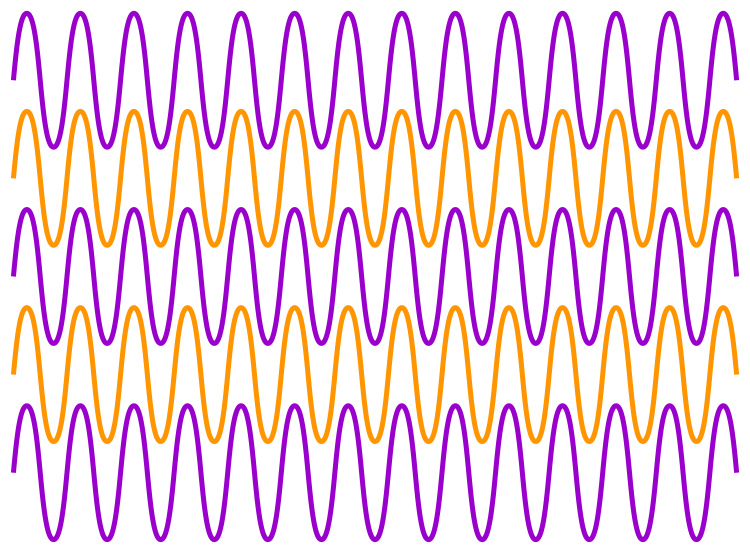 Illusion designology (7): Illusory light perception that cannot be explained by the Fourier analysis. Nikkei Science, 31(8), 66-68 (in Japanese). 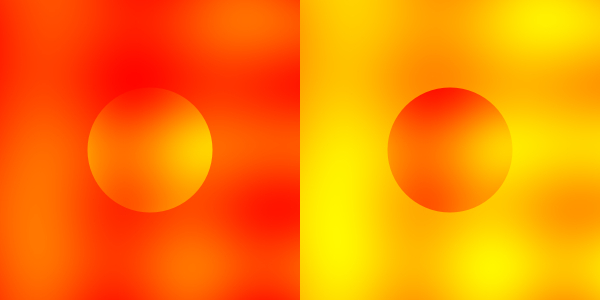 The white background behind the orange waves appears to be tinted orange. 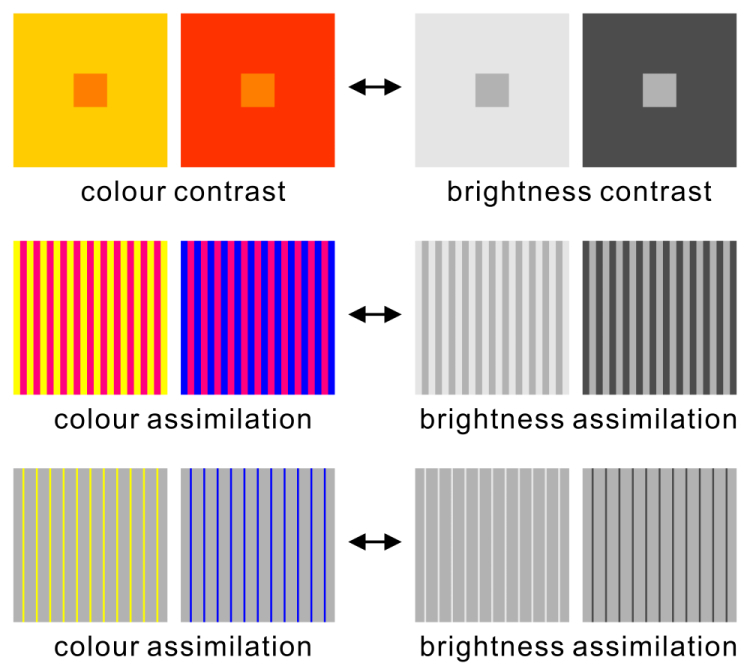 Colour illusions have the counterparts in brightness/lightness illusions. 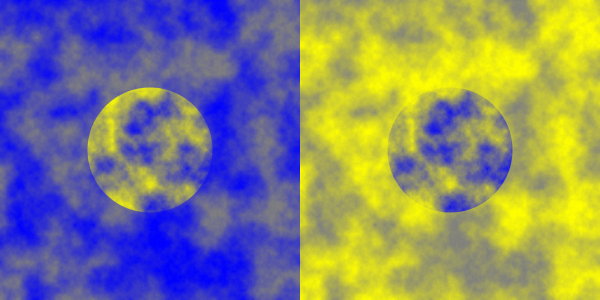 Area "A" appears to be lighter than area "B", though they are the same luminance. Areas flanked by orange borders appear to be tinted orange. Is this correspondence perfect? Let's examine this issue. Anderson, B. L. and Winawer, J. (2005) Image segmentation and lightness perception. Nature, 434, 79-83. 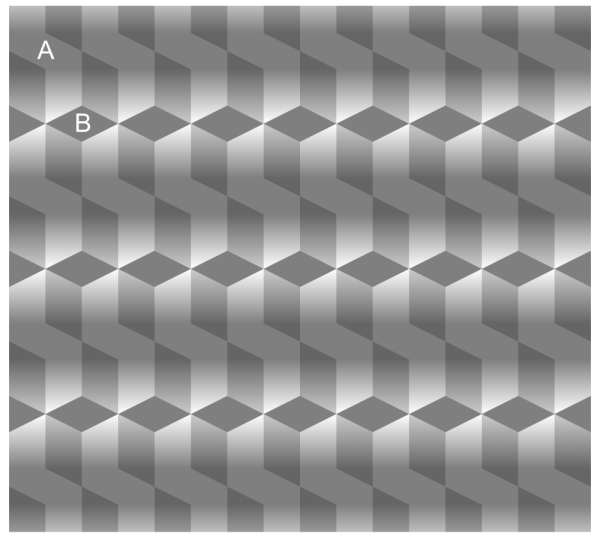 The inset surrounded by the darker background appears to be lighter than the same pattern surrounded by the brighter background. 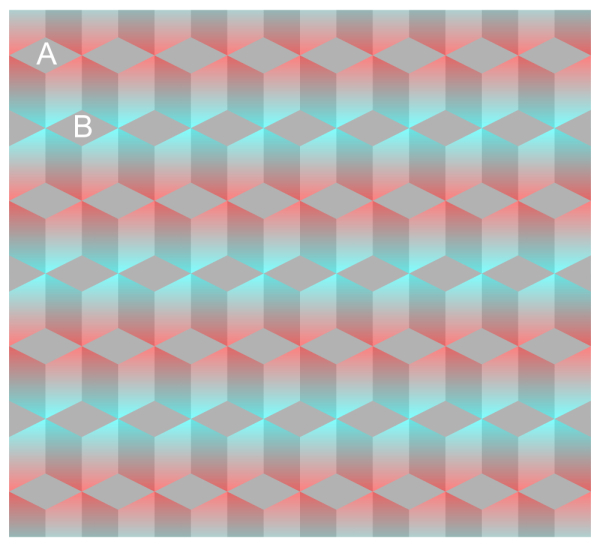 The chromatic Anderson's illusion is possible. Wollschläger, D. and Anderson, B.L. (2009) The role of layered scene representations in color appearance. Current Biology, 19, 430-435. 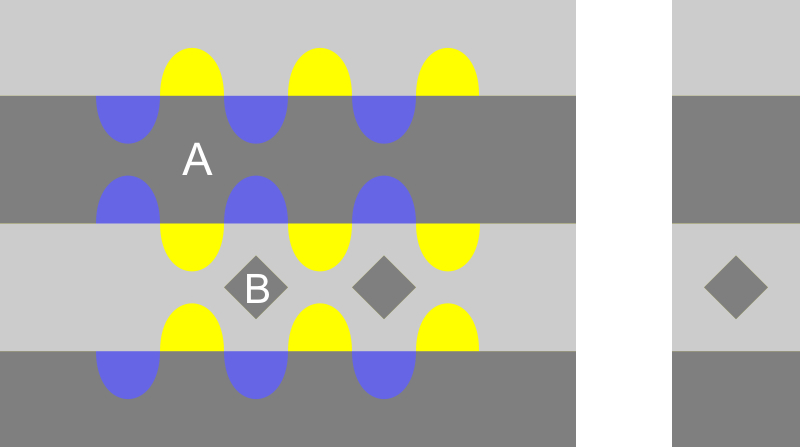 The inset surrounded by the bluish background appears to be yellowish while the inset surrounded by the yellowish background appears to be bluish. 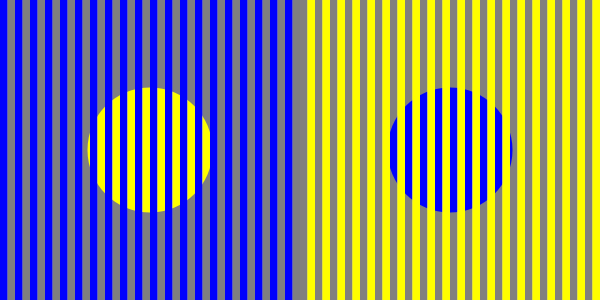 Chromatic Anderson's illusion does not depend on colour contrast, as shown below. 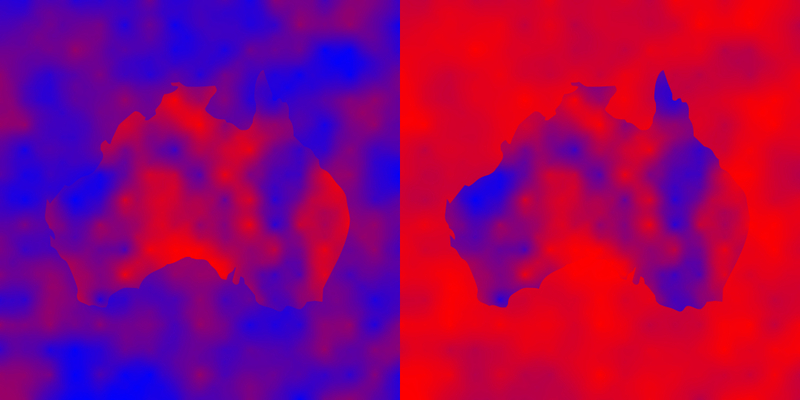 "Australia seen from space and dust storm over Australia"
The two Australia shapes are physically the same color and texture, but the left Australia appears to be reddish while the right one appears to be bluish with red dust storm blanketing it. 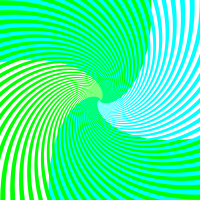 This effect depends on the chromatic version of Anderson's illusion. White, M. (1979) A new effect on perceived lightness. Perception, 8, 413-416. 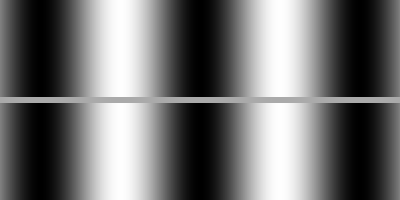 The left gray grating appears to be lighter than the right one, though they are the same luminance. 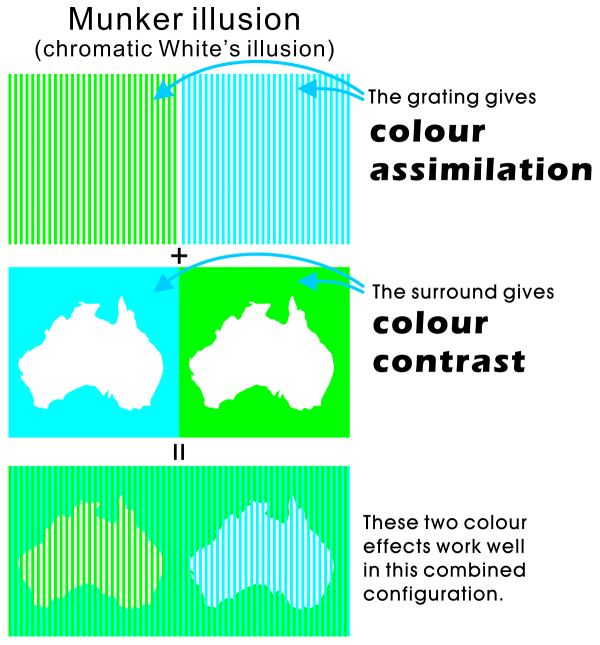 The chromatic White's illusion is possible. It is Munker's illusion. Munker, H. (1970) Farbige Gitter, Abbildung auf der Netzhaut und übertragungstheoretische Beschreibung der Farbwahrnehmung. Habilitationsschrift, Ludwig-Maximilians-Universität, München. 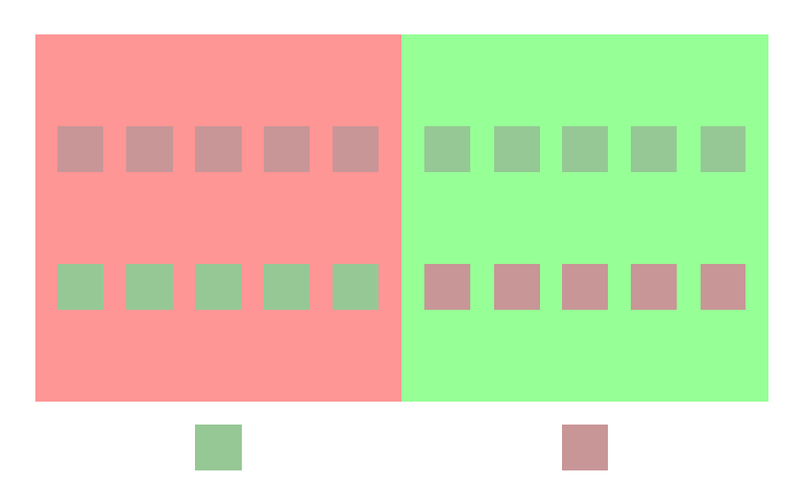 The orange and magenta gratings shown in the upper row are actually the same red, and the yellowish-green and cyan gratings displayed in the lower row are the same green. 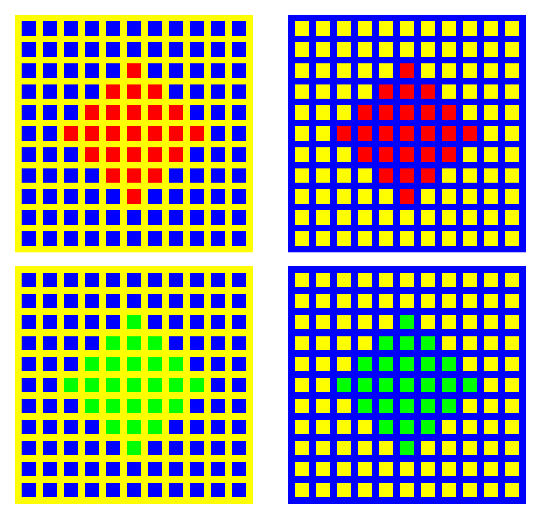 White (1982) proposed another lightness illusion without T-junctions "White's dotted lightness illusion". 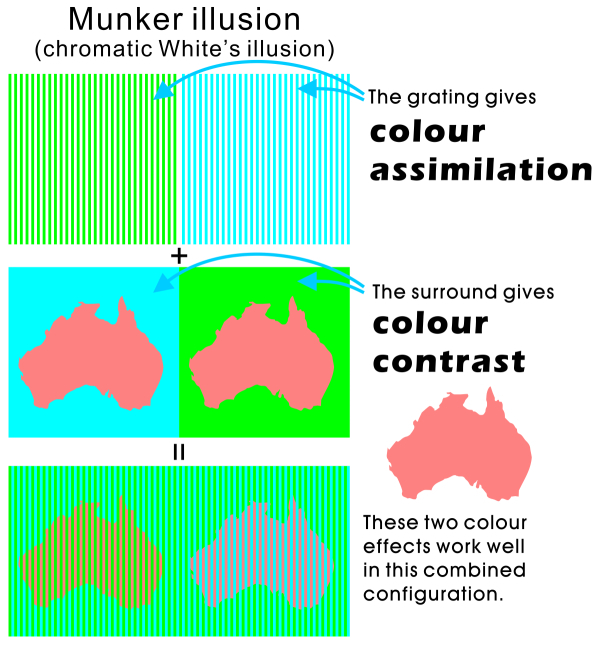 White, M. (1982) The assimilation-enhancing effect of a dotted surround upon a dotted test region. Perception, 11, 103-106. 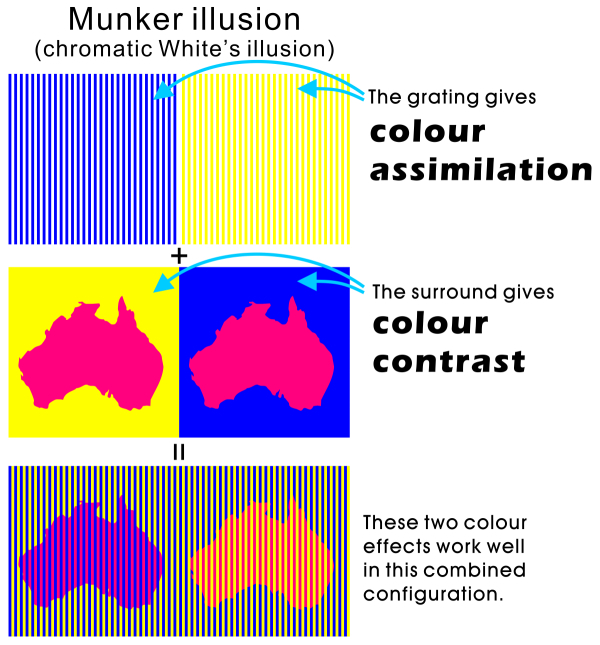 White's dotted colour illusion is possible. 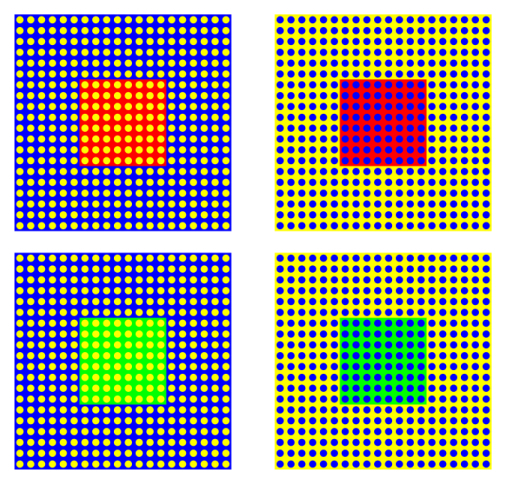 The orange and magenta squares shown in the upper row are actually the same red, and the yellowish-green and cyan squares displayed in the lower row are the same green. I think the dungeon illusion (Bressan, 2001) and the De Valois-De Valois illusion are essentially the same illusion as the two White's illusions. Bressan, P. (2001) Explaining lightness illusions. Perception, 30, 1031-1046. 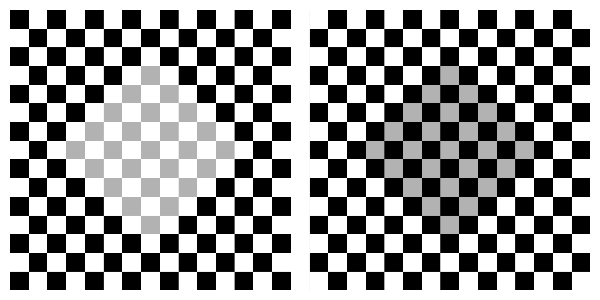 The left gray squares appear to be lighter than the right ones, though they are the same luminance. De Valois, R. L. and De Valois, K. K. (1988) Spatial Vision. New York: Oxford University Press. 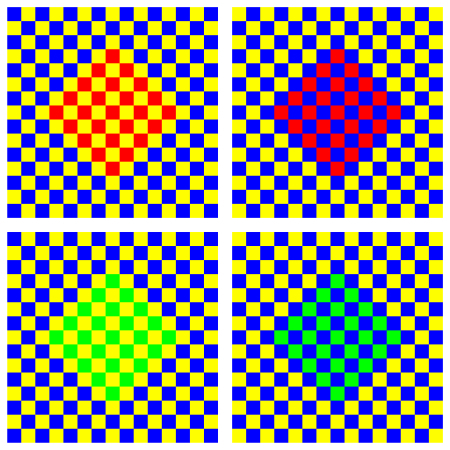 "How to make the four types of color illusions"
Munker illusion Munker, H. (1970) Farbige Gitter, Abbildung auf der Netzhaut und übertragungstheoretische Beschreibung der Farbwahrnehmung. Habilitationsschrift, Ludwig-Maximilians-Universität, München. 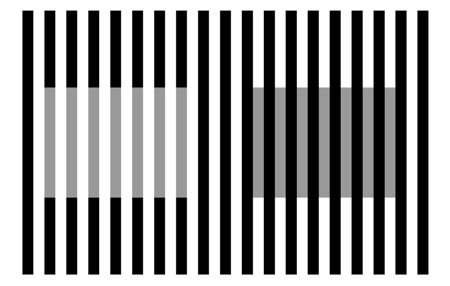 chromatic dungeon illusion For the dungeon illusion: Bressan, P. (2001) Explaining lightness illusions. 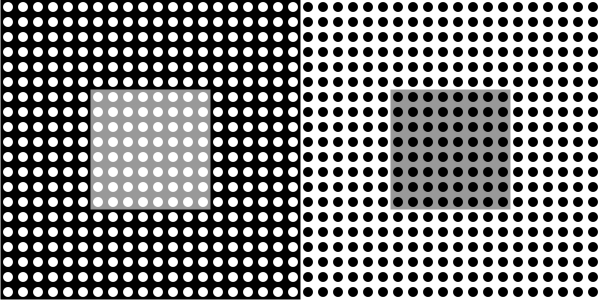 Perception, 30, 1031-1046.
dotted color illusion For the dotted brightness illusion: White, M. (1982) The assimilation-enhancing effect of a dotted surround upon a dotted test region. Perception, 11, 103-106. De Valois-De Valois illusion De Valois, R. L. and De Valois, K. K. (1988) Spatial Vision. New York: Oxford University Press. "How to make the four types of brightness/lightness illusions"
White's effect (White's illusion) White, M. (1979) A new effect on perceived lightness. Perception, 8, 413-416.
dungeon illusion Bressan, P. (2001) Explaining lightness illusions. 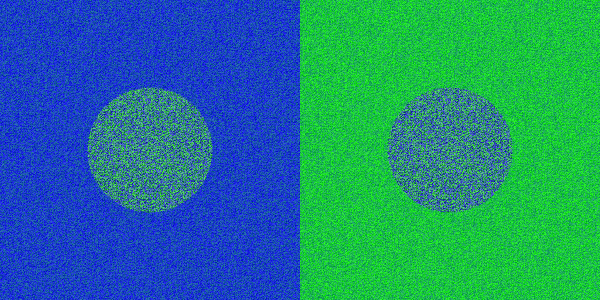 Perception, 30, 1031-1046.
dotted brightness illusion White, M. (1982) The assimilation-enhancing effect of a dotted surround upon a dotted test region. Perception, 11, 103-106. These illusions show a good correspondence between colour and lightness. Logvinenko, A.D. (1999) Lightness induction revisited. Perception, 28, 803-816. A appears to be lighter than B, though A = B in luminance! Incredible! Terrific! Wonderful! 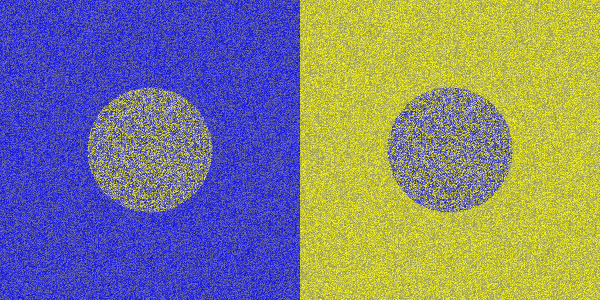 I have managed to get a weak "chromatic" version of Logvinenko's illusion. Is the colour illusion of colour constancy strong enough? The answer is yes! Please see the handout. Adelson, E. H. (2000) Lightness perception and lightness illusions. In M. Gazzaniga (Ed. ), The New Cognitive Neurosciences, 2nd ed. Cambridge, MA: MIT Press (pp. 339-351). 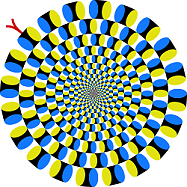 Chromatic snake illusion is possible. 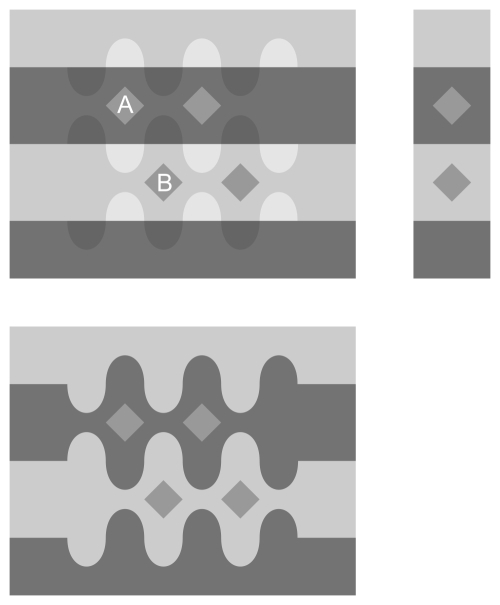 Diamonds are gray, but those embedded in the upper row in each block appear to be tinted. Area A appears to be kind of white and B appears to be bluish, though A = B in physical colour. This is just colour constancy! 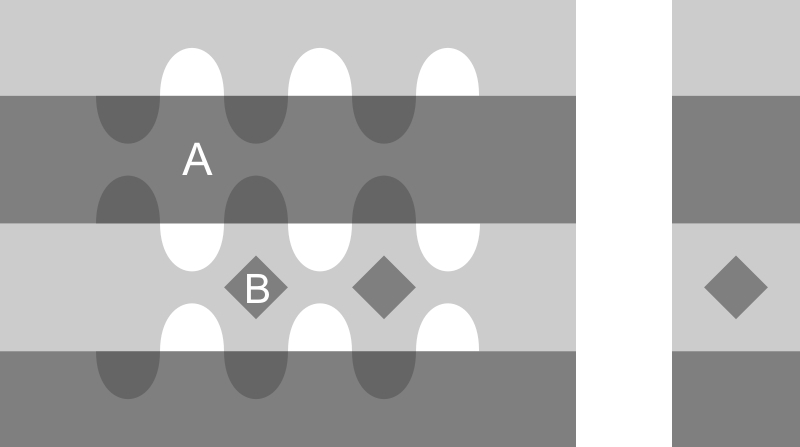 Area A appears to be yellowish and B appears to be gray, though A = B in physical colour. This is just colour constancy! 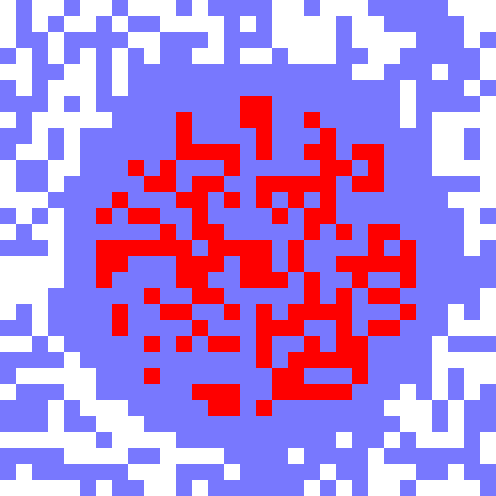 in the Snake illusion configuration. 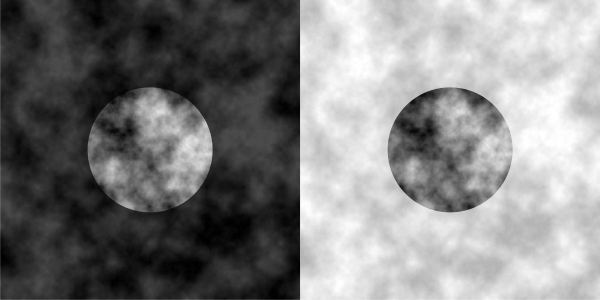 Area A appears to be kind of white and B appears to be dark gray, though A = B in luminance. This is just lightness constancy! in the Logvinenko's illusion configuration. 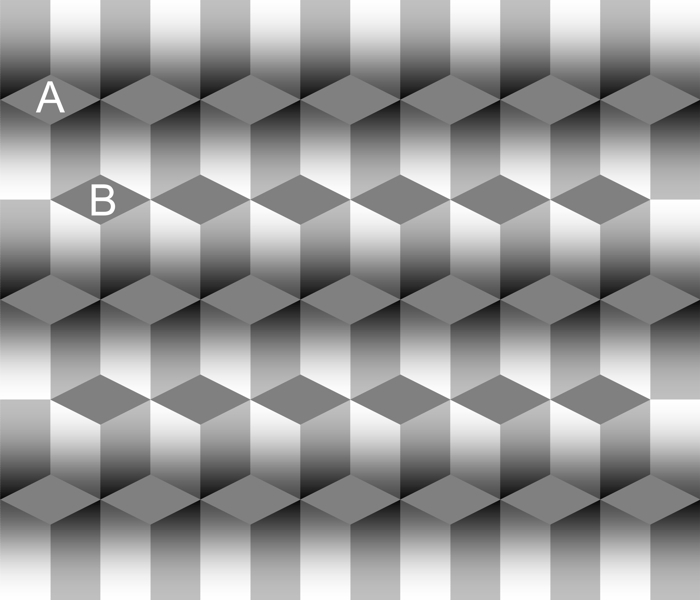 Area A appears to be kind of light gray and B appears to be dark gray, though A = B in luminance. Area A appears to be kind of yellow and B appears to be gray, though A = B (50% black). In my opinion, this image is less "terrific" than the original. Thus, I guess that Logvinenko's illusion and Adelson's illusions are not simple phenomena of lightness constancy, but include other strong brightness effects, e.g. counterphase brightness induction. I struggled to obtain the appropriate counterparts of Logvinenko's illusion and Adelson's illusions in the colour domain, but I am sorry I failed. Correspondence between colour and lightness illusions is not perfect. 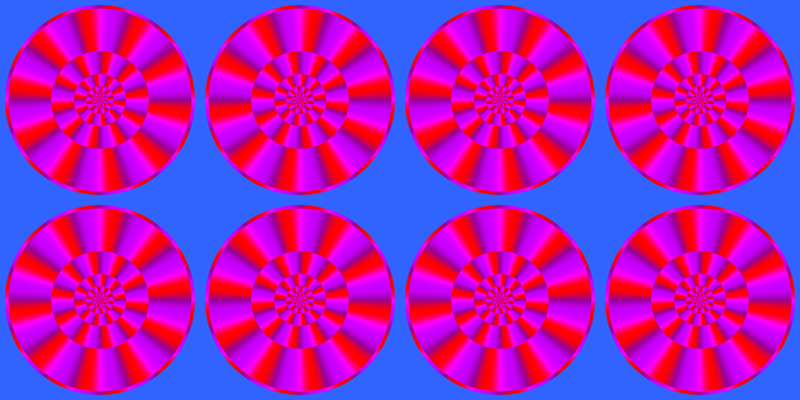 There are many other colour illusions I did not show here.